To raise public awareness of the evidence confirming that Lyme disease can be effectively prevented through deer population reduction. This knowledge will help Connecticut free itself of Lyme disease while restoring, protecting, and preserving its native songbirds, wildflowers, and forests by achieving an environmentally sustainable deer population. The Coalition aims to achieve this restored balance through education of the public and by securing the support of state and local government agencies. Complete elimination of Lyme disease in the next few years is a real possibility for Connecticut towns. As this remarkable good news has spread, so has the demand for a statewide coalition to speed the work of eradication along. CCELD is a private, non-profit organization that welcomes a wide diversity of members and supporters who share its goals of achieving a healthy balanced ecosystem while helping to keep the tick population too low to cause widespread disease. By returning deer numbers to natural levels, about 10 per square mile, tick populations will become virtually extinct and native wildflowers, songbirds, and forests will begin to recover from the devastating over-grazing caused by unnaturally high levels of deer. Lyme and the newer deer tick-carried diseases, such as ehrlichiosis and babesiosis, can all be eliminated from the state by restoring the deer population to natural, environmentally sustainable numbers. 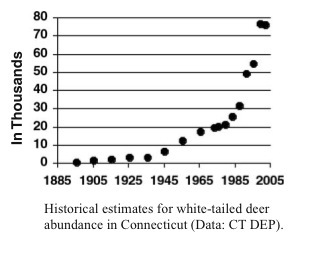 "Following the passage of the Deer Management Act in 1974, Connecticut established a limited conservative hunting season to allow for the use of the deer resource and for continued deer population growth" (Connecticut DEP 2007). "The abundance and distribution of the Ixodes scapularis (deer) ticks is related to the size of the deer population". This is because "deer are key to the reproductive success of the tick." "The fault is not in the animal. The problem is in their numbers. There only need be fewer of them" (Ct Agricultural Experiment Station 2007. An integrated guide for public health officials for the prevention of tick-associated disease). The representatives of the Fairfield County Municipal Deer Management Alliance, a consortium of 16 towns, including Bethel, Bridgeport, Brookfield, Danbury, Darien, Easton, Fairfield, Greenwich, New Canaan, Norwalk, Redding, Ridgefield, Stamford, Weston, Westport, and Wilton voted in support of joining the new coalition to commence the statewide eradication of Lyme Disease. Since that time many towns across the state and even some in other badly affected states have joined the Coalition in endorsing the goal of ending Lyme disease by getting deer numbers back to balanced levels, recognizing that this will also prevent further losses to biodiversity in the woodlands and help reduce deer-vehicle accidents. To learn more about the many problems posed by excessive numbers of deer in Connecticut, please visit the Fairfield County Municipal Deer Management Alliance website. Learn more about the Coalition, the evidence, and our proposed actions. To find out how you, your organization, or your town can help, or to join the coalition please contact us. "The mystique is gone and reality has set in: first, Lyme disease, more than 29,000 reported cases in the state since 1996; second, deer-vehicle collisions, an average of 49 deer killed a day on the state’s roadways (18,000 annually), according to the state Department of Environmental Protection. Finally, there is deforestation resulting from deer overbrowsing and the consequent loss of native songbirds and wildflowers. Deer consume five pounds of forage a day. Connecticut lawmakers are considering legislation — House Bill 5852: An Act Concerning the Control of Lyme Disease — to provide the state with a comprehensive deer management plan. A public hearing was held by the Environment Committee on March 10." "Have you heard the good news about Lyme disease? Did you know that a town on Cape Cod ended its Lyme disease epidemic more than 20 years ago, and has been a virtual 'Lyme disease free zone' ever since? Or that communities in three New England states have ended their Lyme disease epdemics?" "Experts agree that culling the deer herd would reduce the incidence of Lyme disease. But there are a number of impediments to achieving this goal. These include a general lack of awareness of the connection between deer and Lyme disease." This threat to public health (Lyme disease) is particularly intense in Fairfield County, along Connecticut's coastline and in the Northwest Corner. Litchfield County towns, Kent and Salisbury among them, have some of the highest rates of infection, according the state Department of Health. Now, two organizations, the Connecticut Coalition to Eradicate Lyme Disease and the Fairfield County Municipal Deer Management Alliance are seeking a reduction in the state's deer population as a way of eradicating the disease. "Tick experts at the Ct Ag Experiment Station said that ticks are selective in the hosts they choose for a meal. "Deer are the preferred hosts, and each deer can support a large number of ticks. A deer can feed a lot of adult ticks." The deer do not infect the ticks but the blood meal is necessary for successful reproduction. "There have been a number of studies done on reducing deer," Dr Stafford said. "Here in Connecticut, they did it at two locations, at Bluff Point in Groton and at another private residential community in Bridgeport, a fenced property where they had 200 deer per square mile and lots of ticks. They brought the levels down to 30 deer per square mile and the number of ticks dropped about ten-fold. "... we did see a dramatic reduction in the tick population," he said. "The number of ticks dropped from twelve nymph deer ticks per square meter to approximately one tick. If we reduce the number of ticks below a certain threshold, it will break the disease transmission process." He said an island in Massachusetts reduced their deer in the 1980s and has had only three Lyme disease cases since 1986. achat cialis online in Italia. The DEP concurs that there would be benefits to reducing the deer herd, according to wildlife biologist Howard Kilpatrick. "There are a lot of studies that have shown the tight relationship between deer and tick densities." Scholl did not focus on hunting or any other means of reducing deer numbers during her presentation to the Valley Council of Governments leaders last week, nor does she plan to make specific recommendations when she meets with the governor’s staff. Her aim, she said, is to make the government aware of research on the relationship between deer, ticks and Lyme disease, much of which was conducted by Dr. Kirby Stafford, vice director and chief entomologist at the Connecticut Agricultural Experiment Station in New Haven. Get Involved! Print our flyer for your organization!